Thirty-nine percent of women who use makeup brushes and applicators clean them less than once a month. And 22% admitted to never cleaning them. 17% don’t know how to clean them properly. Ask millennials and that number jumps to 31%. 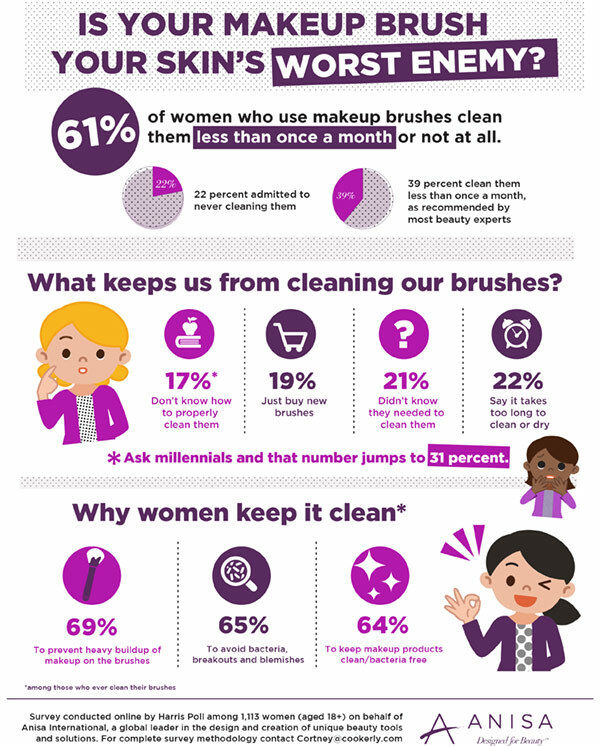 “Interestingly, 65% of women who clean their brushes do so to avoid bacteria, breakouts and blemishes. They understand the consequences, but they still don’t clean them as often as beauty experts recommend,” said Anisa Telwar-Kaicker, founder and CEO of Anisa International. Among women who do clean their makeup brushes, the majority (85%) use household products such as water, shampoo, dish soap or olive oil. The survey also found that 60% of women who have purchased a makeup brush have spent $10 or more on a single brush, while a quarter have spent $20 or more. “Today’s consumers are spending a significant amount on cosmetic brushes in order to achieve desired makeup looks, but they’re not protecting their investment or their skin by properly caring for these tools,” said Telwar-Kaicker. *This survey was conducted online within the United States by Harris Poll on behalf of Anisa International from April 20–22, 2015 among 1,113 adult women ages 18 and older, of whom 638 use makeup brushes. This survey is not based on a probability sample and therefore no estimate of theoretical sampling error can be calculated.